During Prohibition, while Al Capone was rising to worldwide prominence as Public Enemy Number One, the townspeople of rural Templeton, Iowa—population just 428—were busy with a bootlegging empire of their own. Led by Joe Irlbeck, the whip-smart and gregarious son of a Bavarian immigrant, the outfit of farmers, small merchants, and even the church monsignor worked together to create a whiskey so excellent it was ordered by name: "Templeton rye." Just as Al Capone had Eliot Ness, Templeton’s bootleggers had as their own enemy a respected Prohibition agent from the adjacent county named Benjamin Franklin Wilson. Wilson was ardent in his fight against alcohol, and he chased Irlbeck for over a decade. But Irlbeck was not Capone, and Templeton would not be ruled by violence like Chicago. 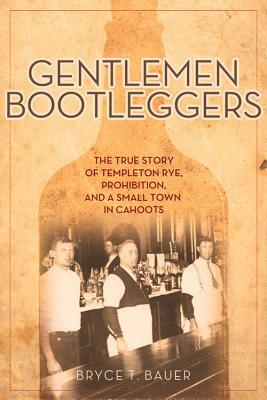 Gentlemen Bootleggers tells a never-before-told tale of ingenuity, bootstrapping, and perseverance in one small town, showcasing a group of immigrants and first-generation Americans who embraced the ideals of self-reliance, dynamism, and democratic justice. It relies on previously classified Prohibition Bureau investigation files, federal court case files, extensive newspaper archive research, and a recently disclosed interview with kingpin Joe Irlbeck. Unlike other Prohibition-era tales of big-city gangsters, it provides an important reminder that bootlegging wasn’t only about glory and riches, but could be in the service of a higher goal: producing the best whiskey money could buy. Bryce T. Baueris a Hearst Award winning journalist who has written for "Saveur, "the "Daily Iowan," the Cedar Rapids "Gazette," and other publications. He is coproducing and cowriting the documentary "Whiskey Cookers: The Amazing Story of the Bootleggers of Templeton, Iowa.""